There are over 50 restaurants at the Universal Orlando Resort complex! While many of these great restaurants are inside the parks, there are numerous outside of the theme parks, at the Universal Hotels and at CitiWalk, where you do not have to pay theme park admission to enjoy them. (Although some clubs may require a cover charge.) One of the newest in-park restaurants is the rustic tavern, Three Broomsticks, the official restaurant of Harry Potter and the Forbidden Journey (at Islands of Adventure). This is where you can dine on authentic British food and try the famous (non-alcoholic) Butterbeer. Also served here are fish and chips, shepherd’s pie, turkey legs, fresh veggies, and more. At the back of the Three Broomsticks tavern, is where you’ll find the Hog’s Head Pub, where adults can sample a great selection of beers, as well as wine, spirits, and mixed drinks. Also located in Islands of Adventure are Café 4, Circus McGurkus Café Stoo-pendous, and Mythos Restaurant. Mythos Restaurant was named the world’s best theme park restaurant for six years running. The unique exterior of towering rock formations with carved ancient figures, and cascading waterfalls set the mood for this dining experience. Inside, you’ll enjoy the cavernous interior and an outdoor seating area with a spectacular view of the park’s sea and islands. The gourmet cuisine includes blueberry and pistachio crusted grilled pork, cedar planked Bay of Fundy salmon, gourmet hamburgers and imported pasta. Mouth-watering desserts and a full wine list are also available, as well as a separate children’s menu. A full-service lunch is served daily. Reservations accepted: Call Universal’s Islands of Adventure Reservations at 407-224-4012. Universal Studios has many in-park restaurants as well, including Lombard’s Seafood Grille, Finnegan’s Bar and Grill, Mel’s Drive-in, Louie’s Italian Restaurant and more. Lombard’s Seafood Grill is a casually elegant full-service restaurant serving fresh seafood, pasta, and more. The décor includes a huge saltwater aquarium in the center of the dining room. Along with the specialty items like New England clam chowder, Bay Shrimp Cobb Salad, Seafood Marinara, you’ll also find appetizers, sandwiches, pasta, and scrumptious desserts. There is a children’s menu available, as well as wine and cocktails. Full service lunch and dinner are served daily. 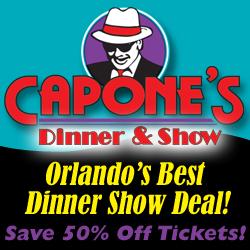 Reservations accepted: Call Universal Studios Reservations at (407) 224-3613. Jimmy Buffet’s Margaritaville provides a laid-back atmosphere with indoor or outdoor seating, live music nightly, and a “Parakeet Beach” area for the little ones to enjoy. The décor was inspired by Buffet’s favorite waterfront concerts, and its 3 bars were themed to Buffet fans. The Volcano Bar is a fan favorite, complete with a giant exploding volcano that erupts periodically. Guess what is erupts with? Margaritas, of course! Along with the many varieties of margaritas and frozen concoctions, the menu features a combination of Caribbean and Key West cuisine. Offerings include Conch Fritters, Jamaica Mistaica Wings, Corn and Crab Chowder, Bayou Shrimp Pasta, Jimmy’s Jammin’ Jambalaya, Calypso Mahi Mahi, Key Lime Pie, and the ever popular Cheeseburger in Paradise®.